The bass is glorious and upper frequencies hardly any less assured. The treble restriction does little to hide detail, which is clear and unforced. Wireworld's range is large and just keeps growing – and evolving. The '6' range replaces the '5' range (no, really) as of now and at the time of writing is not even fully described on the company's website. As far as we can see the main changes are to the plugs, which are aluminium-bodied and have silver-plated copper connector parts. The centre connector is hollow, while the outer is multi-leafed and the plug is a tight fit in sockets. Wireworld uses silver-clad OCC copper for the conductors: OCC stands for Ohno Continuous Casting, a technique for producing very long-grain copper which should, in principle, give near-ideal electrical behaviour. Insulation is high-density polythene. We were surprised how high the capacitance of this cable is – still well below the level that might cause perceptible treble roll-off, but suggesting the use of multiple conductors internally. 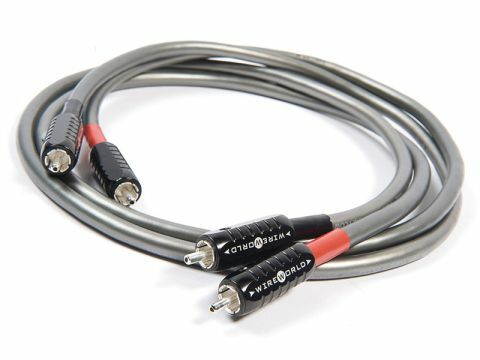 Sonically, this would appear to be the ideal cable for lovers of strong, deep bass. There's a feeling with this cable that a few extra semitones at the bottom end have been revealed. This is really more to do with low end confidence than extension as such, but if you like that sort of thing it's great. Even better, if you're more interested in upper frequency regions there's no price to pay in terms of definition higher up, as the bass is achieved without dominating midrange or treble. The very highest treble may not be absolutely as crystalline as with, say, the Black Rhodium Polar Illusion, but both it and the midrange are unemphatically detailed.